A single-engine airplane crashed Saturday at an air show in Martinsburg, West Virginia, a spokesman there said. 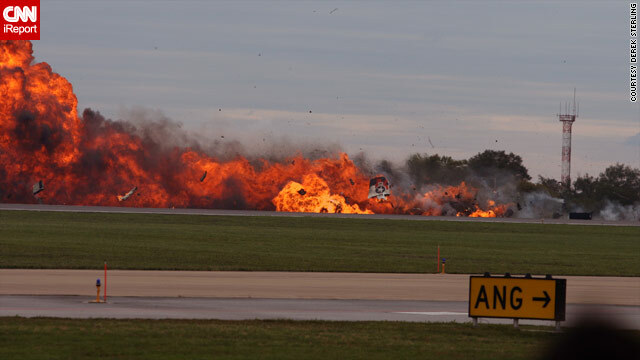 The T-28 military training aircraft crashed at the Thunder over the Blue Ridge air show, Lt. Nate Muellerof the 167th Airlift Wing said. He had no information on the circumstances of the crash or on injuries. The aircraft was part of the Trojan Horsemen aircraft demo team, according to The Journal of Martinsburg. The crash occurred during a stunt in which two T-28s were flying belly-to-belly, according to The Journal. The plane crashed in a fireball in front of hangars, The Journal reported. Shut up sam. It was an accident. Did anyone tell you to get out of the kitchen? Why don't you go to oprah sam? No. I do pretty much what I want. Just ask my jealous ex-boyfriend. You sound like my kind of woman! Wanna @#$%? West Virginia Gun Trader is a forum which is related to sell or trade any gun according to west Virginia state laws. You are welcome to the forum and share everything. Sympathy to the family, and also to those who hjad to witness such a tragedy. GOD bless this country for the freedom we have to buy any kind of weapons it's great to be armed to the teeth, I heard in the news truckers traffic guns from south to north east and Canada it's more lucrative then drugs and easy to do 1000 per item plus the cost of gun retail, it's good money, gun can disassemble and reassembled at delivery. But my question is how and who registers theses guns down south? You're a prophet; can't you tell? And military fighter crafts have parachutes. But civilian airliners? Not one single parachute. Who wouldn't jump for the first time knowing that if they didn't, they would die in the crash. At least have a few parachutes so that at least maybe one person could survive and give us an eyewitness accounting. We all are very familiar with the way flight recirders and black boxes have a way of disappearing 'for reasons of national security'. Imagine if even one person were able to jump form the 9/11 flights...the story they would tell from seeing it with their own eyes. I knew the pilot im sorry it happened to you. I hope you rest well in heaven. BAM! Reality hits you hard bro! West Virginia gun trader is a forum which is related to sell or trade any gun according to west Verginia state laws. You are welcome to the forum and share everything. It's the best time to make a few plans for the long run and it's time to be happy. I have learn this submit and if I may just I want to counsel you some interesting things or tips. Perhaps you could write subsequent articles regarding this article. I wish to learn even more things approximately it!